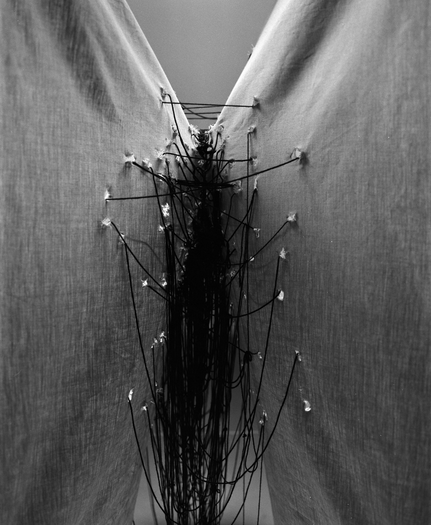 Terry Boyd, a minimalist fiber artist, has created bodies of work that express the importance of memory. 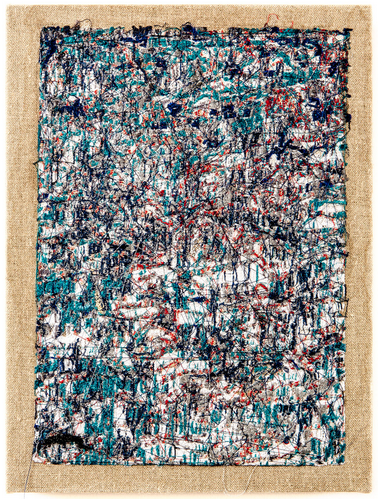 He’s experimented with traditional sewing, using a bow and arrow, and is now teaching his sewing machine to think like an abstract painter. 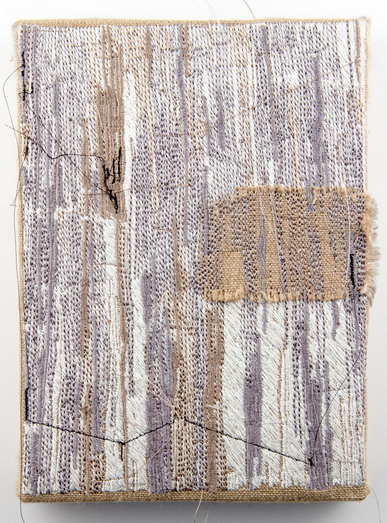 Through performance, pattern and minimalist fiber art, I explore and interrogate systems of visual language. My recent body of work employs both drawing and unconventional sewing techniques. In a systematic fashion, I draw and sew quarter-inch lines from left to right overlapping row by row to create a visual “white-noise”. The repetitive nature of the art-making process intends to trigger a meditative state for both me and the viewer. What motivates/inspires you to create your art? Any specific driving forces? ​ A lot of my embroideries are about the retention of memories. One specific moment comes to mind when I first started making these was forgetting what my deceased fathers face looked like and was using my abstract embroideries as a way to designate time to remembering him. There is so much variation in your fiber work and yet so much order, how do you choose what colors and which position you'll put them in? ​ I spend a lot of time curating the color palette for each of the embroideries. Even the more subtle ones will have somewhere between 15-20 different colors in them (I'll use 4 variations of white and black for each one.) Once the colors are chosen, I try to be purely reactionary to when it comes to placement and composition. . The names you give your works are very intriguing such as, 'Next Year You'll Wish You Started Today'. How are they derived? I have a large ongoing list of the names of pieces. Sometimes, a title will be on this list for years until it finally meets its physical/tangible object. This is funny, I've compiled a list of names to use for future works as well! How much time do you spend on one piece? 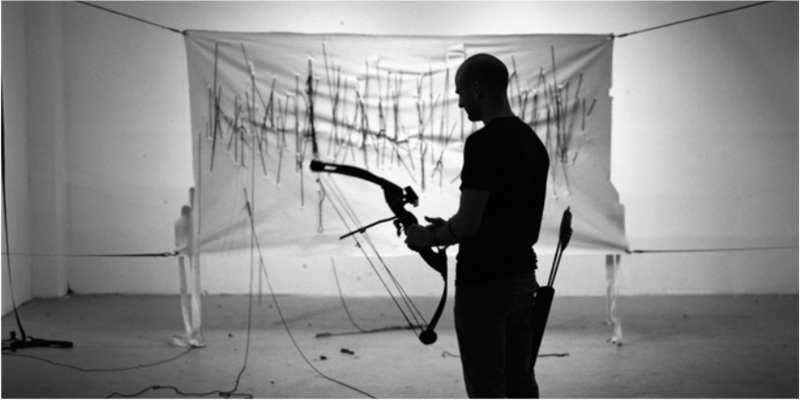 Your bow and arrow performance art looks like so much fun and very methodical. Is it planned? How do you decide in which direction you'll shoot? I usually spend a lot of time planning the methods in which I'll be making a piece, but like the smaller embroideries, the actual mark making/aesthetics have to be somewhat reactionary to what is improvisationally being made. What inspired you to pick up a bow and arrow and do a performance piece? ​ I was looking for a more masculine way to sew. What kind of responses did you spark when you were creating it? You stated that the repetitive process was meditative. Was that what inspired to move forward with it? or is it something you realized while you dove head in with your art? ​ It was something that I discovered by accident. ​At first it was more of an art making exercise to fill a page or a piece of canvas with a simple, repetitive mark. While making the pieces, I became really fascinated to where my mind would wander off to. This became a bit of an obsession and I felt that I needed to work bigger and more complex to go even further. "... I was looking for a more masculine way to sew..."
What other meditative activities do you enjoy? ​This is it! Although, I will be heading to Bhutan this April to learn more formally about the meditative and spiritual aspects of fiber making / weaving at the Royal Textile Academy. Any new projects you'd like to reveal information on? ​I'm now starting to do very intricate stitch work on photo documentation of my bow and arrow pieces. Just started my first prototype last week and I can already tell that it's going to be a significant body of work to add to my portfolio. I'm also really exited about my tattoo book project but i don't see that being finished for another 2 years. How many pieces do you decide will go in a series? Do you create until you no longer feel the need to or is there a set amount you like to create? I don't really see an end to this particular series. Each of the "Insufficient Data..." and "Infinity Plus One" works are named both after our universe's largest stars and black holes. I guess when I make an embroidery for each one, I'll stop then. What other mediums have you used? Which ones do you prefer and do not, other than fiber. ​​ The embroideries spun off from a series of minimalist line drawings. I also fable in wearable textiles and oil painting. When did you have the "aha" moment in defining that you'll transition (or combine) your background in Data Marketing and Visual Art? When I was nominated emerging artist of the year in Pittsburgh while working my marketing job. That was the moment that made me quit my job to go full-time on art. Can you please tell me more about "visual white noise?" ​ ​The idea of making an aesthetic from something random data entry points. Similar to the fuzzy static you would see on a television when the signal cuts out. The idea of teaching your sewing machine to be an expressionist painter is very cool. Tell me a little more about that. ​Taking something that has a logical system in place - my embroidery machine - and trying to introduce something a little bit more spontaneous and poetic. Typically these machines are used make safe and accurate graphics. I like to think that by layering and reworking the piece and adding a bit of an unplanned element is the same motion a painter would take when taking on a canvas.